"Advanced civilizations may live safely inside the supermassive black holes in the galactic nuclei without being visible from the outside." Vyacheslav Dokuchaev at the Institute for Nuclear Research of the Russian Academy of Sciences in Moscow. We love Russian astrophysicists at The Daily Galaxy: The discovery of stable orbits inside certain kinds of black hole implies that planets and perhaps even life could survive inside these weird objects, says Vyacheslav Dokuchaev at the Russian Academy of Sciences in Moscow. Dokuchaev points out that certain black holes can have a complex internal structure that could allow photons, particles and perhaps even planets to orbit the central singularity without ever getting sucked all the way in. Cosmologists have been aware for some time that there are regions inside charged, rotating black holes where objects such as photons can survive in stable periodic orbits. Dokuchaev's contribution is to study these orbits in detail and to explore their dynamics. One of the problems that would at first seem to negate any chance of planetary orbits inside a black hole is that inside the event horizon of a black hole, radial dimension becomes time-like, rather than space-like. Conventional orbits are clearly impossible. But further in there is another horizon where the dimensions switch back again (at least, inside charged and rotating black holes). This is the inner Cauchy horizon and it's beyond here that Dokuchaev says the interesting orbits for massive planets exist. Dokuchaev calculates that the stable orbits are nonequatorial and have a rich structure. They would also be brightly illuminated by the central singularity and by photons trapped in the same orbit. Dokuchaev also believes that a planet in such an orbit could support a complex chemistry that is rich enough to allow life to evolve. "Advanced civilizations may live safely inside the supermassive black holes in the galactic nuclei without being visible from the outside," he says. Such a civilization would be subject to huge tidal forces and energy density that builds up in these stable orbits as photons become trapped. There's also the problem of causality violations, which some cosmologists predict would afflict this kind of weird space-time. 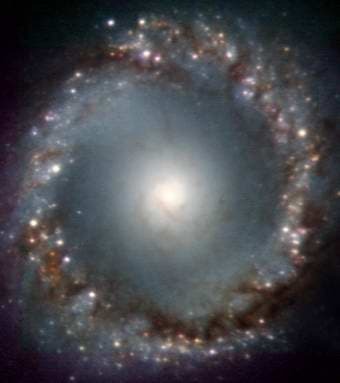 Image top of page: Near-infrared images of the active galaxy NGC 1097, obtained with the NACO adaptive optics instrument on ESO's Very Large Telescope, disclose with unprecedented detail a complex central network of filamentary structure spiralling down to the centre of the galaxy. These observations provide astronomers with new insights on how super-massive black holes lurking inside galaxies get fed.